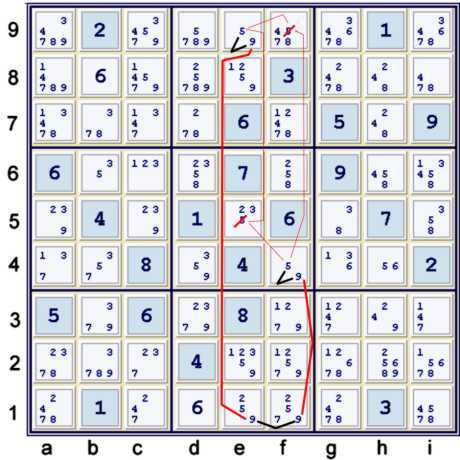 The following illustrated proof for the relatively easy Tough Sudoku of June 16, 2009 serves as a reasonably good example of the power of one type of relatively simple Sudoku solving technique. 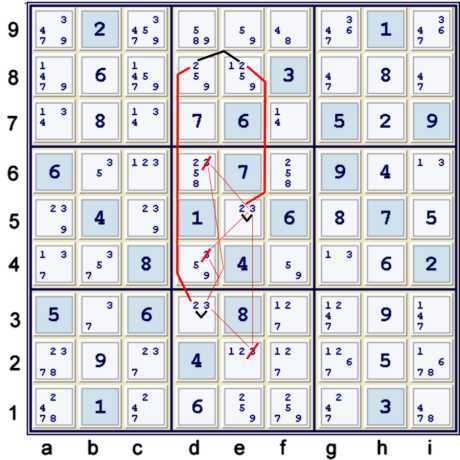 This particular Sudoku solving strategy, tip or trick is sometimes referred to in Sudoku forums as the W Wing. This blog discusses this strategy numerous times, albeit under a different name. I previously have referred to this technique as a very common Y wing style. It is disussed in some detail on the Y Wing Styles page. If this is your first visit to this blog, welcome! Unfortunately, if you are a first time visitor, this page may seem like it is written in a different language. Well, it is!! Previous blog pages may be helpful. Links to these pages are found to the right, under Previous Entries. The earliest posts are at the bottom, and if you have never perused the intricacies of our special coded language here, you may wish to start close to beginning. 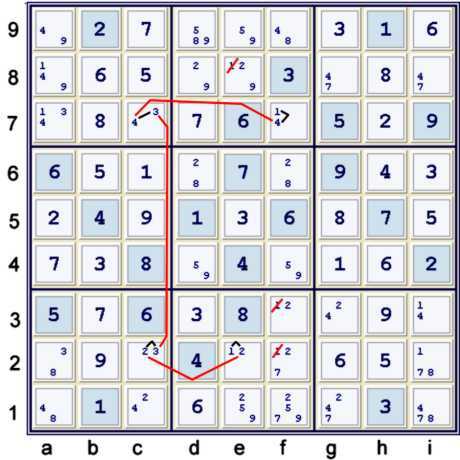 In some of the illustrations, more than one step is shown at once. This reflects an attempt to shorten the page. However, it may contribute to some confusion. Hopefully, the confusion is managable. 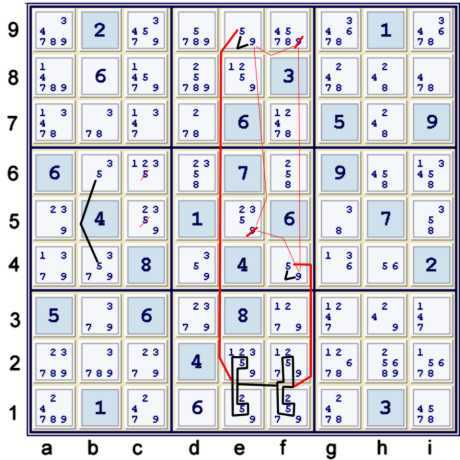 For those whom do not wish to struggle through the illustrations, I have written the steps taken in this proof at the bottom of the page in sudoku.com.au notation. Two Unique Possibilities (UPs) are available here. 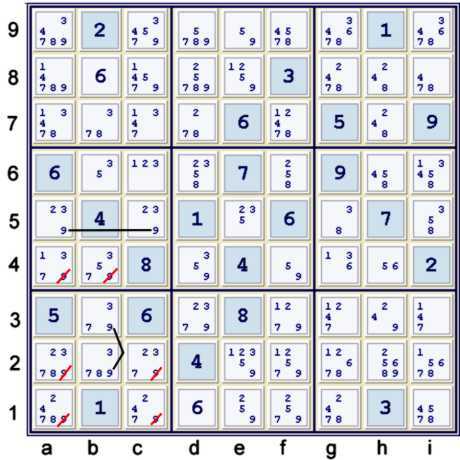 This brings the puzzle to UP 24 (Unique Possibilities to a total of 24 given plus solved cells). Other similar very easy steps are also possible. 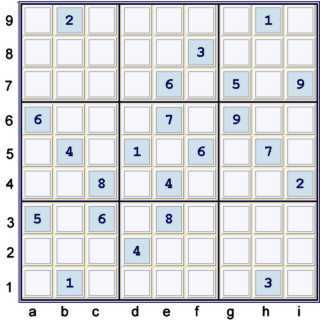 A step that, IMO, is almost as easy as the group of standard Sudoku solving techniques, strategies, tips or tricks is shown in the center three boxes. The common marker to look for this step is two cells limited to exactly the same two candidates. When these two cells do not share a common container, but do share a bi-local strong inference set that sees the two cells, one has a W Wing. Oftentimes, as illustrated below, the bi-local strong inference set uses one or more groupings to create the two condition state. Below, again two steps are shown. Since candidate 9 is now limited to ef1 in row 1, we have another W Wing, this time using bilocal (9). Of some minor interest, (59)e9 and (59)f4 are remote pairs. 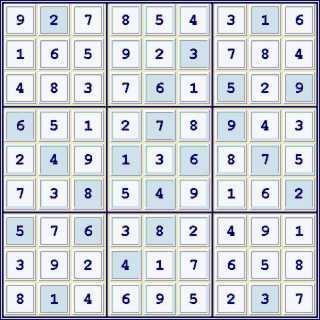 Below, there are many ways to finish this puzzle. One could use a Unique Loop with candidates (59)at ef1, df4, de9. One could eventually use a BUG +2. ETC. The short chain illustrated below also suffices. A cascade of naked singles finishes the puzzle. 1) Start with 22 givens. UP 24.